Title: Study of Broadside array antenna. Broadside array is one in which number of identical parallel antennas are set up along a line drawn perpendicular to their respective axes as shown in fig 1(a). In broadside array, individual antennas are equally spaced along a line and each element is fed with equal magnitude, all in same phase. This arrangement fires in broadside directions i.e. 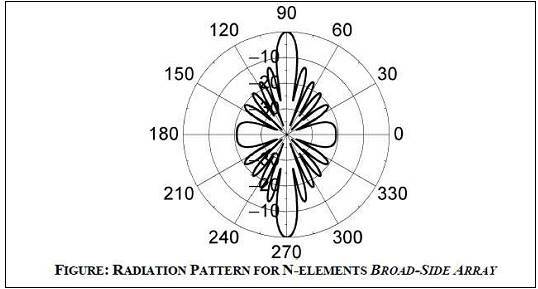 perpendicular to the line of array axis, there are maximum radiations and relatively a little radiations in other directions and hence the radiation pattern of broadside array is bidirectional as shown in fig 1(b)., which radiates equally well in either direction of maximum radiations. In broadside array, it is desired to have maximum radiation of an array directed normal to the axis of the array (broadside =90Â°) to optimize the design, the maxima of single element can be accomplished by the choice of the radiators and those of array factor by the proper separation and excitation of the individual radiators. This value of Ïˆ, when substituted in equation 1 makes the array factor attain its maximum value. How to convert broad side array radiation pattern into unidirectional? What are the characteristics of broad side array? In BROAD SIDE ARRAY ANTENNA the maximum radiation is always perpendicular to the axis of antenna array i.e. at 90Âº and 270Âº and the maximum radiation can be obtained by increasing the number of elements. Students will able to model the Broadside array antenna, compute the performance parameters and compare the performance parameters with standard parameters.